It never fails, every October, in advance of Halloween, I think of this nightmarish freak featured so prominently in Washington Irving‘s timeless tale THE LEGEND OF SLEEPY HOLLOW. What a rip roaring hair-raising tale for kids of all ages (me included)! With fall in the air, dead leaves doing creepy whispery things in the wind at night, owls hooting, birds darting for cover, any half-wit would sense something is “afoot”–especially someone as susceptible to frights as the incomparable buffoon Ichabod Crane. If you haven’t read it, give yourself a treat. Today I find it amusing and so very clever, but when I was a kid it gave me a serious case of the creeps. The story is so American, as told by Irving, and yet (God forefend!) this preternatural monster and its image has stalked cultures all over the world, so our particularly delicious Yankee dementia at the very mention of its name is not unique or confined to Sleepy Hollow. This entry was posted in Book Reviews, Humor, Literature and tagged American Literature, ghost stories, Halloween, Headless Horseman, Ichabod Crane, Irving, Legend of Sleepy Hollow, Literature, Sleepy Hollow, Washington Irving. Bookmark the permalink. 10 Responses to Skeered to Death! The Headless Horseman Rides Again! I loooove the Legend of Sleepy Hollow. Amercian classic! I do too, Roberta! A one of a kind Americana literary romp! The characters are priceless. Ha Ha! Just blogged about that one myself the other day. Agreed, way better than any film version. Cheers! 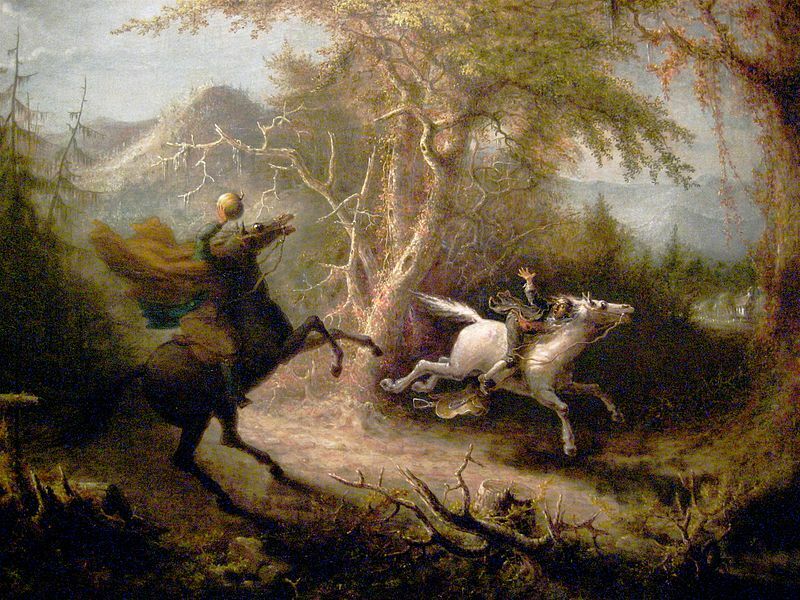 The story of Rip Van Winkle was also written by Washington Irving and lasts for ever more . I have been an Icabod Crane to my Katrina Van Tassel for years and never get tired of the story..
You must be a sweetheart to don that moniker for your darling!